(Nanowerk News) Earth's magnetism has captured human attention since the first innovator noticed that a freely moving piece of magnetized iron would always align itself with Earth's poles. Throughout most of history, the origins and physics of this magnetism remained mysterious, though by the 20th century certain things had been learned by measuring the magnetic field at Earth's surface. These measurements suggested that Earth's magnetic field was consistent with that of a giant bar magnet embedded deep inside Earth. However, the magnetic field observed at the surface of our planet is constantly fluctuating. During the 1930s scientists pioneered explanations that such fluctuations were due to streams of particles from the sun striking and becoming entrapped within Earth’s magnetic field. Truly understanding Earth's magnetic environment, however, required traveling to space. In 1958, the first US rocket -- known as Explorer 1 and led by James Van Allen at the University of Iowa -- was launched. By providing observations of a giant swath of magnetized radiation trapped around Earth, now known as the Van Allen Belts, Explorer 1 confirmed that Earth's magnetic environment, the magnetosphere, was not a simple place. We now know that it has a complex shape – compressed on the side facing the sun, but stretched out into a long tail trailing off away from the sun -- affected as much by incoming material from the sun as Earth's own intrinsic magnetism. This magnetic field constantly fluctuates in response to both internal instabilities and events on the sun. It also provides a home for a host of electrified particles spiraling through this complex system. A Scientific American article in 1963 said: "Conditions in the magnetosphere are so diverse and so variable . . . that millions of observations by scores of satellites and rocket probes have only begun to plot the broad outlines of this extension of the Earth into space." The age of magnetospheric science had begun, and it hasn't stopped yet. In 2012, those observations continue with the latest addition to NASA's heliospheric fleet: twin satellites launched on Aug. 30, 2012, originally named the Radiation Belt Storm Probes. On Nov. 9, NASA announced that to honor the scientist who helped launched the field, the probes will be renamed the Van Allen Probes. The renaming comes simultaneously with a standard milestone for any NASA mission: the end of commissioning. Commissioning occurs after launch when all the instruments have been turned on and tested. The end of commissioning also marks the beginning of the prime science mission. "We are excited to be honoring James Van Allen in this way," says David Sibeck, NASA's mission scientist for the Van Allen Probes at NASA's Goddard Space Flight Center in Greenbelt, Md. 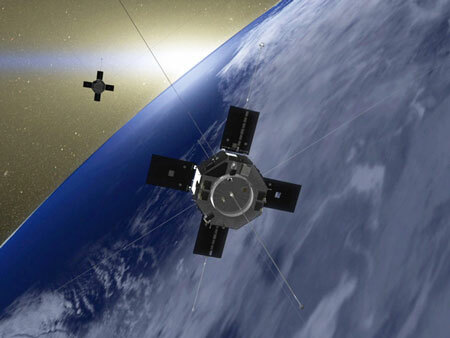 "This is an important mission that carries on early magnetospheric work. In the past we have only had one spacecraft at a time looking at the radiation belts. The state-of-the-art instruments we have now are going to be able to comprehensively observe all the types of particles and waves in this part of the magnetosphere." Indeed, the preliminary data returned from the Van Allen Probes' first two months already has scientists very excited. The instruments all meet or exceed mission specifications and some papers and publications are already planned based on just the first few weeks of observations. The probes have a planned two-year mission, each with a similar orbit that will carry the spacecraft through all parts of the radiation belts. The basic goal of the mission is to understand what causes the belts to swell and shrink in response to incoming radiation from the sun. Such changes in the belts can endanger satellites in space that orbit near the belts. To distinguish between a host of theories developed over the years on the radiation belts, Van Allen Probe scientists have designed a suite of instruments to answer three main questions. Where do the extra energy and particles come from? Where do they disappear to, and what sends them on their way? How do these changes affect the rest of the magnetosphere? In addition to its broad range of instruments, the mission will make use of its two spacecraft to better map out the full spatial dimensions of a particular event and how it changes over time. "We know examples where a storm of incoming particles from the sun can cause the two belts to swell so much that they merge and appear to form a single belt," says Shri Kanekal, the Van Allen Probes' deputy mission scientist at Goddard. "Then there are other examples where a large storm from the sun didn't affect the belts at all, and even cases where the belts shrank. We need to figure out what causes the differences." Of course, just like Explorer 1, any new spacecraft will provide unexpected observations that can dramatically change the models and theories about a given region of space. The magnetospheric science that James Van Allen helped initiate will surely provide additional surprises as the Van Allen Probes sweep their way through the radiation belts.